Honestly, it’s about time. 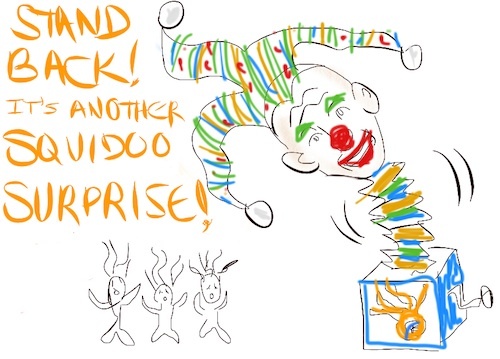 Many of us expected Squidoo to shut down, barring a miracle, towards the end of last year. Hubpages’ staff is much better about announcing changes well in advance, explaining them clearly, and sometimes (gasp!) listening to member input and concerns and adjusting plans accordingly. Usually, any important announcement comes from CEO Paul Edmondson, who reads through responses as his time allows and answers some member questions. A CEO actively engaged with the community and listening to member concerns. Let that sink in for a moment. I think you’re going to enjoy Hubpages for being stable and un-buggy, for not making huge changes every month or three that require you to overhaul all your articles, and for paying each article based on its own visitor impressions and ad clicks. I don’t know about you, but I was sick of the lensrank bell curve even though I was one of those who profited from it. I’m afraid that some of you are not going to enjoy Hubpages’ tighter quality standards, two-link-to-the-same-domain limit on each article, and extreme caution regarding Amazon and other affiliate links. Just understand that it’s for every member’s protection, to make sure we don’t lose Hubpages the way we just lost Squidoo. Hubpages uses human raters and editors to judge hubs before they go live (see the Learning Center guide to Hubpages’ Quality Assessment Process). This is one reason it’s faring better with Google than Squidoo was. It does mean you have to be patient. It’ll take a day or so for newly-published articles to be vetted. Just as a lensrank of around 10,000 or better on Squidoo was the ticket to decent earnings, the magic number on Hubpages is $12.50. That’s how much your hubs need to earn per week to add up to the payout threshold of $50 by the end of the month. Once your hubs start earning, their earnings for the past seven days are posted at the top of the dashboard, so it’s easy to keep track. One of the BIGGEST things to get used to on Hubpages is that, while you can track your day-to-day earnings far more easily, there is no breakdown of which hub earned what. This used to drive me crazy. How could I tell which hubs were successful, if I didn’t have that data? But a side effect of this is that it forces you to rely on quality indicators and visitor traffic as your means of evaluating your hubs, instead of only considering them in terms of their earnings potential. That, too, may be a factor in why Hubpages has been faring better with Google lately. Remember that you can delete hubs AND your Hubpages account later. For that reason, I suggest making the transfer and getting a Hub account set up, to make sure you’re in the driver’s seat with your own content. You can then decide which articles to leave on Hubpages and which to move elsewhere, at your leisure. We need to diversify. I’ve been putting eggs in multiple baskets since 2012, but I just lost my biggest basket. Once the dust settles at the beginning of 2015, I’m going to be experimenting with at least one alternate basket. I suggest you do the same. Monetized blogs, YouTube videos, Kindle books, Zazzle or Redbubble designs— there’s a lot of possibilities. If you’re not so busy keeping up with changes at Squidoo, you may have more time to look into them. And now a few personal notes about my situation. But before I look ahead, let me take one last glance over my shoulder. I had written no less than three different “Farewell to Squidoo” posts since June 2013. Every one of those posts was too self-centered, too petulent, too much of a rant, so they’re still sitting in my drafts folder. Flynn the Cat, AJ, Paula and others said all I might’ve said more eloquently and with more grace, or at least with more of a sense of humor. So I’ll let them speak for me and just sum up with stats. …You know how I love graphs and charts. …I expect another $100-200 from the final payout, assuming we receive it. Yep, I used to average about a million views a year on Squidoo. Lately I’ve been averaging around 10,000 weekly visitors across 400 lenses, and about 3,000-5,000 for about 100 hubs. So yeah, my Hubpages traffic is better. So for me, this change is probably a good one. That’s why Hubpages members will only give vague ballpark figures or nonspecific answers about earnings. 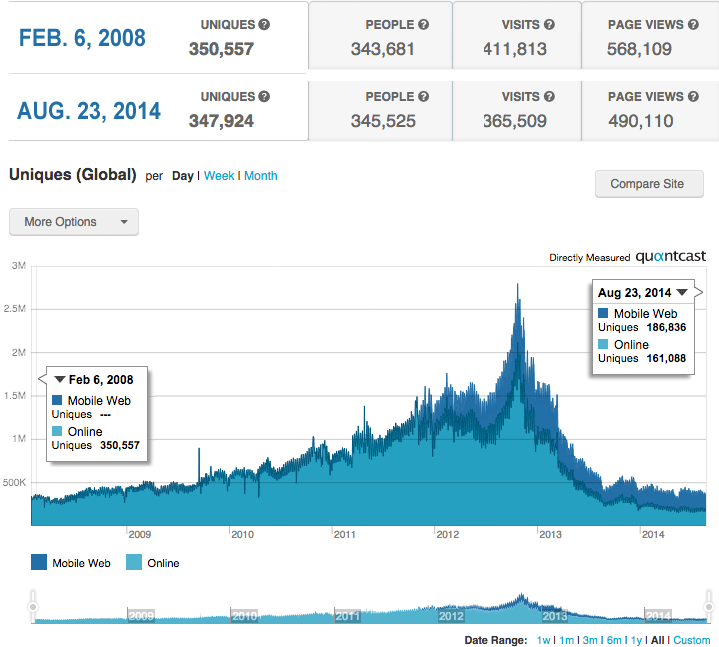 ..two more graphs from Quantcast, which sum up how we got here. 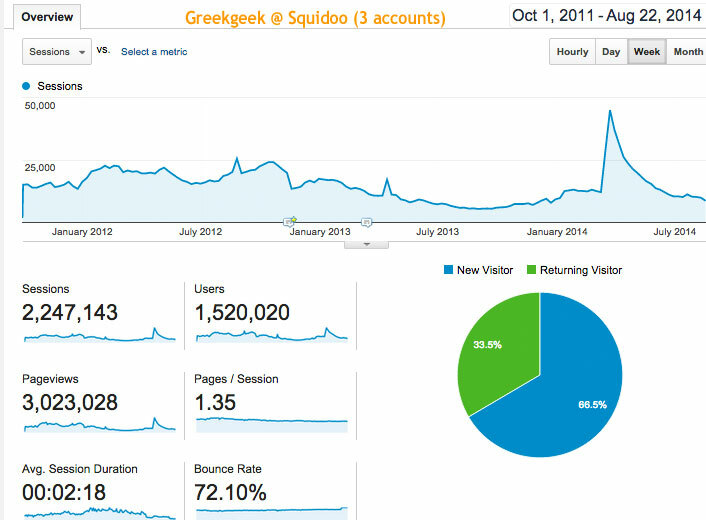 …Squidoo was pretty well doomed when it couldn’t climb back up to 500,000 visitors a day. I wish I could remember how many pages there were on Squidoo back in early 2008. Surely, even with all the deletions, there are hundreds of thousands more lenses now than there were six and a half years ago. So the fact that we have less traffic now than we did then, even with the growth of mobile giving people more ways to access the site, is telling. 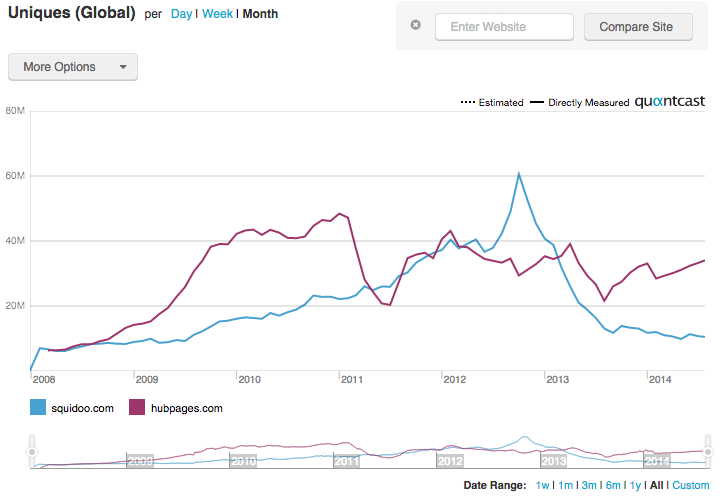 Finally: a tale of two websites, and their Panda woes. Thanks for your perspective. It’s a sad day but as you say it has been coming for a while now. Indeed. I had worded my opinions on that subject rather more strongly, then censored myself: thanks for saying what I was beating around the bush. Thank you, Greekgeek. After a week or so of abject lamentations, it’s refreshing to read a positive, forward-thinking recap of the situation. Death by a thousand papercuts, indeed—but those heal over time. I look forward to the healing process beginning shortly. You said this so much more eloquently than I could have. I agree with the idea of moving to Hubpages now and dealing with things later. It would have been nice for Squidoo to give us a little more notice, but hey stuff happens and we can just go with the flow. It’s great to see you share your Hub perspective as I feel that lots of former Squids are a bit worried about the change. But I think that the end of Squidoo is a relief, the agony was too long. I just didn’t have the courage to pull the plug myself, they did it for me. No regret, no tears, it’s over. Wishing you the very best for your lens new lives else where. Excellent review, thanks. You were one of my first contacts on Squidoo and I have always enjoyed your lenses and posts. It’s a shame to see Squidoo disappear, but the good news is that we now know where we stand and can take action to save and revamp our lenses. I wonder if they had taken a different approach 2 years ago when Google upset the apple cart, would things be different today? I feel it’s been the constant reliance on automated filters, the flagging and deletion of lenses that were valued one month and “not what we want” the next that has driven members away and also led to less traffic from Google, moreso probably than anything Google itself has done. Like you suggested I am letting my lenses transfer across to Hubpages where I hope some will fare well, and the rest will be rewritten and moved to other sites as necessary. Yes, I believe Squidoo could’ve recovered with a different approach. I became active on Hubpages in 2011 when it was hit hard by panda and suffered a huge exodus of members. I wanted to understand why Hubpages was suffering so badly under Panda when Squidoo was prospering, even though they were similar sites. I spent a week analyzing how they were structured differently, and how they dealt with quality issues. In 2013, I was bemused to find nearly everything I had critiqued Hubpages for and praised Squidoo for doing had now been implemented by the other site. No wonder their fortunes reversed! But that is water under the bridge, and there’s not much use kicking a dead horse. I just hope Hubpages sticks to its guns and avoids repeating Squidoo’s mistakes, even if it causes some headaches for us adapting to its slightly diffent approach. So many user-generated content sites have folded — Trion, Suite101, ezinearticles, associatedcontent, mahalo, Knol and probably more that I’m forgetting — while Hubpages remains one of the top 100 most visited sites in the U.S. There was a time not many years ago when Squidoo was higher on that list than Hubpages was. That just shows how careful HP needs to be. Ellen, like you I have waited before publicly commenting on that dreadful attempt at spin by Seth Godin. He must think we are all idiots to not see the real message – but then I don’t think he cares what we think anyway. No business can be run effectively by Committee in the absence of a leader who has lost interest. Maybe he saw Squidoo as “easy, residual income” but to achieve that you need people to run things who really know what they are doing. Also, the absence of any kind of Project Management, where one project is actually finished (and properly debugged), can only end in one way – chaos. The analyses you have done over the years and shared with us here, is one of the things that helped me to understand that Squidoo would not recover from the downward spiral that started in 2012, unless they themselves managed to understand why it was happening and what they needed to do to save the site. I just have this image of headless chickens running around while Squidoo burns! I do believe Squidoo could have been saved if only the HQ Team had the intelligence and humility to listen to and accept what people like yourself and Katinka were saying. However, perhaps Seth was bored with it all and wanted the site to slide so he could justify offloading it. But of course we will never know, because it seems he cannot resist spinning in preference to telling the truth. Ouch. I’m balancing frustration with tact, and you lot keep saying the things I’ve been thinking but have been too tactful (or too cowardly) to say. Again, thank you. Yes, it’s hard for me to believe now that I was paying hefty bucks in 2011 to see Seth talk. I really liked the “support yourself and charity too!” message he espoused. Ironic that he’s been so dismissive of the work-at-home parents, seniors and disabled writers who were supplementing recession-stepped family budgets with their Squidoo income. I don’t think he ever really grasped that Squidoo’s best charity work was not the Acumen Fund, but in providing a vehicle for thousands of disadvantaged and low-income individuals to help themselves. I note the date, as well. Editor-in-Chief Megan Casey announced her departure on August 15, 2012, and within a few months, Squidoo started taking on water. Seth announced Squidoo closing on August 15, 2014. Seth was mostly a figurehead, I think; Megan was the functional CEO. I didn’t always agree with her decisions, but I felt she was a little better about two-way communication and in considering the feedback of members even when it was delivered bluntly. I agree with your statement wholeheartedly here Ellen. I think that once Megan left, no one was running the ship. Even though Squidoo’s demise was obvious to anyone willing to acknowledge it, it is still sad to see the end of what was once a terrific avenue for many to not only have somewhere to write but the opportunity to earn a little money as well. I cannot help feeling that so much of what Squidoo HQ put us all through after taking that huge slap from Google could all have been avoided if those in charge had just listened! They were told time and time again that there was spammy content being slapped up left, right and center, and chose to do nothing about it until Google made them sit up and take notice. When HupPages took a hit from Google Squidoo should have used them as an example and taken measures to avoid the same happening. They chose not to, and now have suffered the consequences. 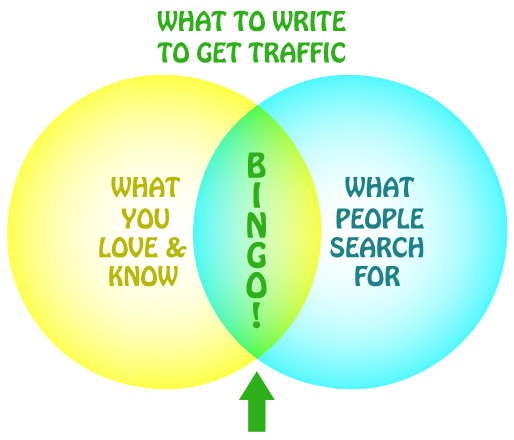 I would certainly be hesitant to hitch myself to any wagon that Seth Godin was driving ever again. His reputation must surely have taken a hit over this. I am sure that anyone researching his name will now have some interesting reading! Great to hear that you are faring well on HubPages, Ellen. Hearing of other lensmasters doing well there will be encouraging to those who are fearful of how they will survive there. I, of course, had lost all of my lenses (and consequently 90% of my income) some months ago but my partner will be transferring there and then assessing how best to make his lenses fit HP’s quality criteria. I think he will do just fine with some tweaking and a couple of deletions. I am very apprehensive about this. Those quality standards will likely kill me. Not because of my lack of quality, but because I credited all my photos – even my own – with a link. And, now those links will make the page unacceptable. I have promised others links when I got permission to use their photos. It will be a GREAT ENDEAVOUR to made good on those promises while keeping pages complete. The time needed to make this work may be more than I have available. We will see. Yes, that was what originally put me off of Hubpages in 2008 or so. Whenever the two-link-per-domain filter was added, all my image credit links suddenly resulted in my account being flagged as a spammer. I’ve never entirely found the solution to that problem, although at least many CC sites are whitelisted. Is a link required for an image or just a statement saying where you got it from? It depends on the source. Some require a link — many deviantArts do — while others only require text attribution. It sounds like kab took the time to contact many photographers individually and get personal permission, in exchange for a link (“I have promised others links.”) Hence Kab’s dilemma. I’m glad that you asked. I just looked back at the creative commons license FAQ, and it seems that CC images do NOT require an active link, only attribution. It’s been so long since I checked the guidelines that I had forgotten that! Sites like Flickr and Wikimedia Commons provide us with Creative Commons code that has the link built in. On Squidoo, I just copied their attribution code and added a dab of CSS to turn it into a caption centered under the image. But I see that was only a recommendation, not a requirement. You are correct that diversifying is the key. I have been using that as my rallying cry for a while and last December started almost exclusively putting my time into contracted freelance writing. Money upfront and no bones about what you are earning. Sounds like a sound plan for someone who really is doing this professionally. I was always, really, an enthusiastic dilettante. While my goal was to cover my daily expenses via online earnings, and I felt very proud when I hit that milestone in 2012, it was simply a matter of pride. After Squidoo earnings went pear-shaped, I eventually gave up trying to regain my high water mark. So I can afford to dink around with Hubpages even if it doesn’t add up to a living wage. Whereas you and many other hardworking souls are true professionals and/or need to earn a living online as efficiently as possible. You can’t afford to waste time experimenting, investigating, and toying with trial and error as I do. I hope I can at least offer some knowledge gleaned from dinking around that others find useful. It is sad to see Squidoo close down. But I haven’t been making much money there in the last year. Fortunately I started building my own niche websites and have been getting results that way. I am going to go ahead and let my lenses transfer over to hubpages like you suggested. I guess we will see what happens. Was interesting to see your Squidoo stats. I got pretty much the same total amount of money since I’ve been on Squidoo (30k+) and my 300 lenses are ( were) still getting around 10-12k visits. Going down from 70k to 10k is a major drop though. But we knew the end was coming, it’s just the abruptness of it that gives us that bitter taste in our mouths…Seth Godin is no longer a name I care to read about any time soon. I’ve been doing pretty well out of my several blogger sites, transferring the massive amount of niche content. It’s all been neglected for the last year, but the earnings are relative to the amount of effort I put in, and often outperforming Squidoo (affiliate. My adsense earnings are just sad!). So if Hubpages isn’t an option (which it won’t be for half my stuff – *screams internally about the link restrictions*) there are other options. …for people with less in the way of carpal tunnel and more time! I’m currently planning to ignore it all and then see how many lenses survive as hubs. …hahahahahaha. Oh wow. I just went and read my blog posts. So much ranting. I’m not sure I was at all graceful there (you’re just linking to me so you don’t have to be directly rude yourself. I’M ONTO YOU). They were extremely cathartic, though. And if it weren’t for the sore hands, would have been five times as long.